As I went through my photos for today’s post, I noticed that almost all of the human size sculptures were women. I wonder why? 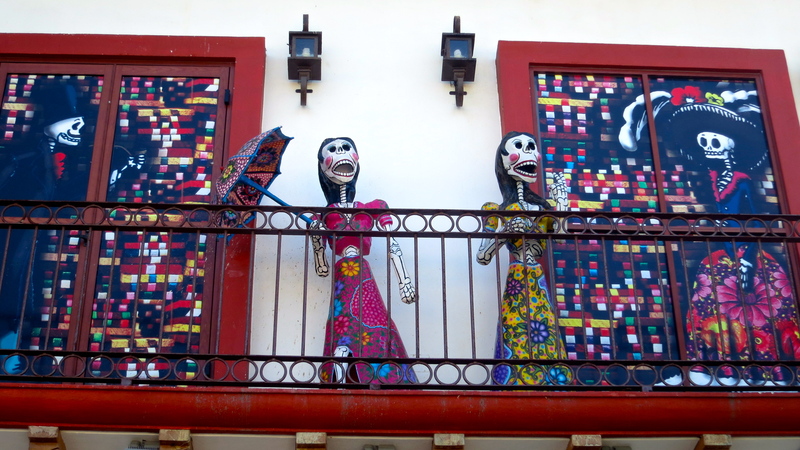 The Day of the Dead, or Día de Muertos, is a seriously fun holiday in Puerto Vallarta and throughout Mexico where the dearly departed are celebrated with hopes that the celebration will help them on their journey. 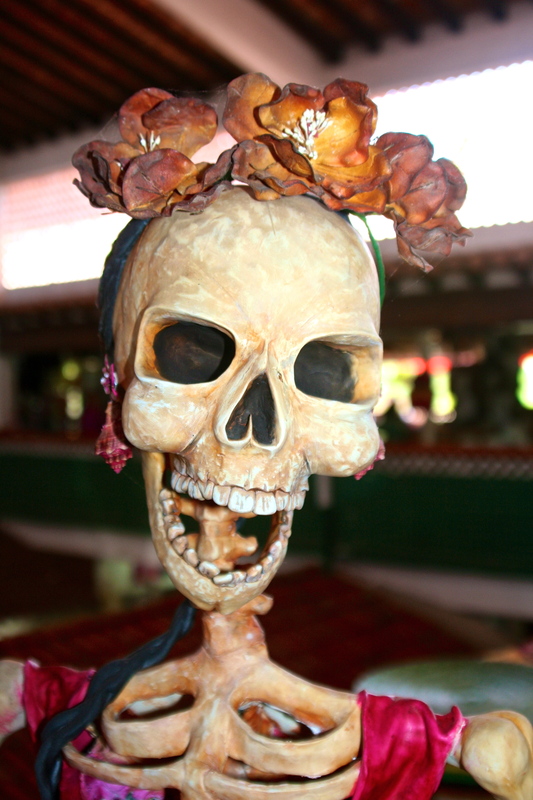 People dress up in dead-people skeleton costumes, altars are established, and special foods are prepared. Gaily decorated skulls and skeletons are everywhere. Peggy and I have yet to be in Mexico when the event takes place (which is at the end of October/beginning of November), but the skulls and skeletons are still around, lots of them. The skulls seem to represent both sexes equally, although this one seems to have a feminine cast to it. The gold teeth made me think of the dentist’s chair, a place I am all too familiar with. Ouch! Of the life-size sculptures, I photographed, I could only find one man. This led me to speculate, naturally, as to why. I don’t think there is a reason particular to the holiday. About an equal number of men and women die, right. So is it that the girls dress up prettier, or that their eyes are more beautiful, or is it some other attribute, like the colorful bosom of the top photo. Obviously, clothing is important, and you can do so much more with hats! And certainly this woman with her red flowers and curls is well-dressed. The hat and the boas lit up the lady from an earlier year. But what’s with the dead roses? And here. Same girl dressed up differently it would seem. Remember the Red Hat Ladies. How about a long necked Red Hat Lady? This gal had something to say. But I am not sure you would want to hear it. Here was my only large guy sculpture. I had to go back in time to find it. 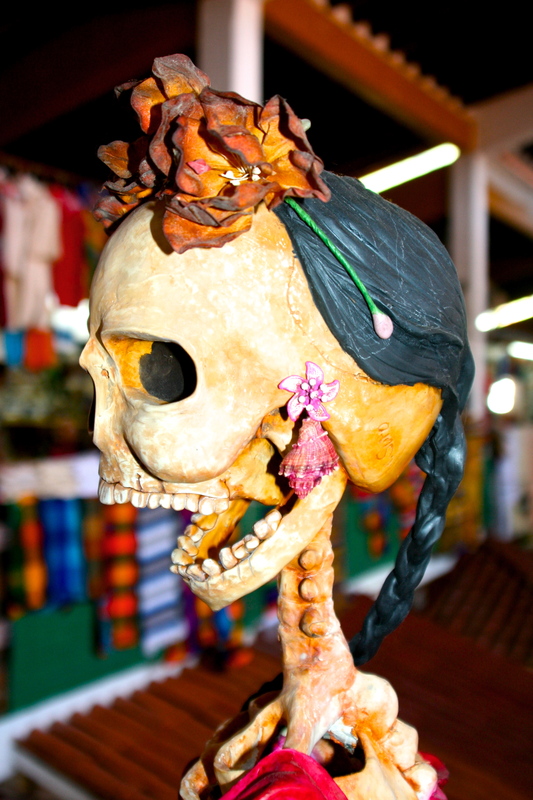 Smaller sculptures are found in the shops, often representing Huichol art. The red fingernails were a nice touch. Peggy and I were walking down one of Puerto Vallarta’s road and came on this lady walking her dog. And then there was this tile of a man out walking his dog— a dog that has a mission on its mind. Humor is an important part of the Day of the Dead. Here’s a lady monkeying around. And a lady on a dish. Once again, the hat is an important item of clothing. Skulls are found just about everywhere. And are creatively decorated, with clouds, for example. You could have your kitchen decorated with Day of the Dead tiles. Maybe even peace symbols. I conclude my Day of the Dead collection with this fellow. Just possibly, he had imbibed a little too much Huichol peyote! NEXT POST: I am back on the PCT making my way between Carson Pass and Sonora Pass.